Practitioners of the Yoruba Religion, which was developed among the Yoruba people of Nigeria and Benin, believe that before we are born we stand before God and choose our own destiny. We decide before we ever arrive on earth what we will contribute to the world, where we will live, who we will love, and even the day we will die. However when we are born into the world all of our plans and promises are forgotten and so our destiny in effect becomes to remember and claim the destiny we mapped out for ourselves before our arrival in this life. So who exactly is God? The Yoruba call Him (or more correctly “it” because God is much to all-powerful to be limited by gender) Olódùmarè. The Supreme deity of the Yoruba, Olodumare lives in the sky and much like Brahman of Hinduism, is much more respected than He is ever actually approached by worshipers. Olodumare is a distant god and when it comes to day to day prayers, things are much more commonly handled by intercessors called Orishas. Much like the Saints of Catholicism, Orishas are intercessors between the world of humanity and the divine, often acting on behalf or even against worshipers on earth. There are several types of Orishas, some of whom seem to have always been and were present at the creation of the world, others who were actual people who made the leap to semi-divinity, and still others who take the form of natural resources such as rivers or trees. One of the most striking aspects of Orishas is how incredibly human they are. Unlike the saints of Catholicism, Orishas not only marry but divorce, eat and drink, and have their own tastes in everything from music to alcohol. In fact one female Orisha named Oshun is said to have dumped one of her lovers because he made the mistake of taking up drinking a beer she didn’t care for. Like Hindu gods, they never claim to be perfect or even close to it and much like humans also suffer for their misdeeds. Like most humans they have a mixture of good characteristics and bad and challenge us not to perfection but to balance out our own bad habits or deeds with good. Rather than living in the sky, most Orishas actually live in the earth or may incarnate into rocks, rivers, or mountains. The Yoruba traditionally also associate certain Orishas with different numbers, colors, drum beats, even pieces of clothing, which has the effect of creating a whole unseen dialogue or code of sorts between Orishas and humans, signs of which can be seen almost anywhere. As far as exactly how many Orishas there are, the answers vary widely depending on who you ask. Some say there are as many as 400, others that there are over 3000 and still others maintain that no matter how many, they are all actually just incarnations of Olodumare much like the gods of Hinduism are all incarnations of one Supreme Being. Regardless, most practitioners in Cuba and Brazil where the religion was widely spread during the Transatlantic slave trade only acknowledge one or two dozen. To read more about individual Orishas follow the link at the bottom of the page or if you just can't wait click here. In the Yoruba religion Orishas often possess the bodies of their followers or more specifically their priests. This is often done through an elaborate dance ritual where certain Orishas are evoked with drumbeats or different kinds of chanting. As the priests dance, Orishas are said to rise up from the earth (where remember, most of them live rather than Heaven) and “mount” not only the bodies but also the souls of those involved in the ritual. From the point that the priest has been overtaken by a god he speaks, acts, and even dances not as himself but as the Orisha that has overtaken him. Not only men but women as well often take place in these dances, sometimes cross-dressing as gender is a slippery thing among Orishas who not only pay little attention to it but often times switch gender themselves as they travel from place to place. In fact many of the men of Brazil and Cuba find this gender bending as well as the thought of being “mounted” by anything, even an Orisha, so emasculating that oftentimes the priests of these countries are either women or gay men. Like most religions traditions however not everything or rather, everyone, is out to help humanity toward it’s goals. There are also beings called Ajogun which are negative forces that can cause illness, accidents, depression, or other sorts of general calamity. Kind of like demons, Ajogun are to be avoided and sometimes those afflicted with them see an Ifa priest who performs a divination ritual to figure out how to get rid of the troubling spirits. The Yoruba don’t really believe in the concept of secularization when it comes to problems. If you’ve got one you’re either having problems with an evil spirit, a witch, or you have upset or neglected an Orisha who must be appeased. 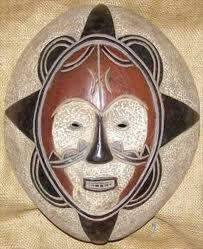 Another foundation of Yoruba belief is a force called Ashe which is possessed by both gods and men. Ashe is a sacred life force that’s similar to Chi in Chinese traditions or the energy that flows through Chakras in Indian beliefs. A powerful force, Ashe has the power to bring about change, whether good or bad and is contained in everything from lighting and hurricanes to blood and sacred names. It’s concept has often been the cause of the Yoruba being mistaken for idol worshipers, because though an explorer might have thought a practitioner was worshiping a flower or river, ect, it was more that he was admiring the Ashe it happened to contain. The focus of the Yoruba religion has never been salvation of any sort, but focuses more on living a great life right now. Though there is mention of a good and bad heaven, most followers hope for reincarnation which in this tradition is a good thing, as opposed to say Buddhism where it’s something to be escaped. Tradition has it however that cruel people and those who commit suicide are not reborn so there is still defiantly a karma like factor involved. 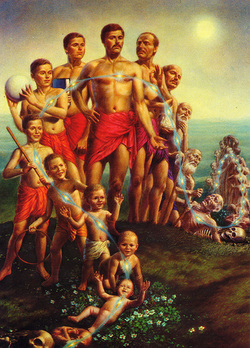 Oftentimes children are thought to be the reincarnations of ancestors especially ones they resemble. It’s not uncommon for a boy to be called names like Babatunde which means “Father Returns” or Yetunde which means “the mother comes back again”. Gender is hardly ever taken into account because its believed that it often changes with reincarnation. One of the things that makes this religion unique is it’s use of divination to communicate with the Heavenly realm. 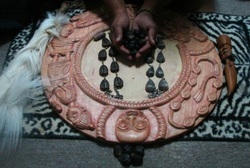 You see the Yoruba have specially trained intercessors called either Babalawo if men (which means Father of secrets) or Iyalawo if women (Mother of Secrets) who through an intense period of training are taught divination techniques that allow clients to seek help or advice from the Heavenly realm on anything from relationship problems to job issues. While they may sound a lot like your average run of the mill psychic, Babalawo are actually different in several ways. First of all, they don’t claim to have any special power in and of themselves. They are merely people who are masters of the art of Ifa divination which involves knowing how to cast divinations with palm nuts, recording the results, and reciting the poem connected with each result. This however is not quite as easy as it sounds because the chances of any one result coming up are 1 in 256 and four poems must be memorized for each one. - The Babalawo or Iyalawo begin with sixteen palm nuts which they hold up to the client’s “Ori”. The word literally means head but much more importantly is believed to be the spiritual center of one of the two souls that all humans have, this one being associated with destiny. 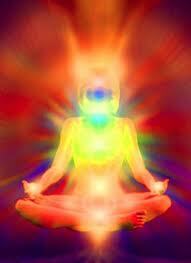 There is also another soul called emi which is associated with the breath. - The Babalawo then shakes the palm nuts randomly from hand to hand until only one or two of them remain. - He does the random shake 16 times and at the end of each notes the results of the nuts that are left in a divining trey usually full of sand where he can make marks. - After the first 16 times, he does the random shake yet another 16 times. The end result of both times (16x16) leaves him with one signature result out of 256 possible ones. 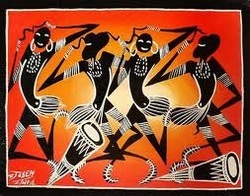 - Each of these possible signature results has four poems that accompany it, all of which the Babalawo has memorized. Based on the signature result, he recites the proper four beginning with “Ifa says”. - The client, after listening to the four poems decides which ones best fits his or her situation. - The Babalawo then recites all the stories and verses he knows that coincide with whichever poem the client has selected and the client is left to apply these to their circumstance. - The Babalawo often recommends a sacrifice of some sort which could be anything from the blood of a chicken (which is then cooked and eaten) or a fruit to an act of charity. Much like Hinduism, the Yoruba religion is incredibly receptive to other beliefs often adopting them and intermeshing them with their own. The Yoruba have never seen a need to develop any sort of a creed, establish a hierarchy, or otherwise institutionalize their religion in any way. So when something comes along that they like or find useful, they are much more inclined to adapt it rather than turn it away. Some claim that this was an intricate part of the survival of their religion, especially during the Trans-Atlantic slave trade when slaves where brought to the Christian world of America and sold to white men who would never tolerate their traditional beliefs. Undeterred however, many of the Yoruba continued practicing their religion in plain site for generations by camouflaging it as Catholicism. You see as different as the two may seem, they actually have remarkable parallels. Both have an all powerful God who can be approached through a series of Orishas or as Catholics call them saints. So the Yoruba merely began assigning different Orishas to different saints and continued in their native beliefs right under the noses of the Americans. Yoruba belief is to this day still very popular in both Cuba and Brazil though it’s extreme ability to adapt to other religions makes it hard to determine exactly how many adherents there are worldwide. Many estimates however put it easily among the world’s top 6 most practiced religions. 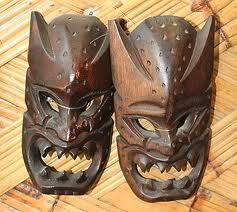 It is also related to or inspired beliefs such as Lucumi, Umbanda, Condamble, and Voodoo.